This past Sunday, the students enjoyed a break from the hectic city life and spent the day in Tigre. Located just 50 mins from Buenos Aires by train, the town of Tigre is a perfect weekend getaway. The name Tigre was given to the city due to the tigers that were once hunted there. The town is settled on an island that was created by the excessive flooding of its rivers and streams. Today, Tigre only floods a couple times a year, however, Angie, the educational coordinator at Elebaires, has lived in Tigre all her life and told the students her memories of having to kayak home from school after a day of flooding. She told us that it happened often when she was a child but it rarely happens now. Angie walked us around her hometown as she explained some of its history and culture. Unlike Buenos Aires, Tigre has a very relaxed atmosphere and a slower pace of living. That is one of the many reasons that Tigre is a popular spot for tourists and weekend destinations. Tigre also offers spectacular boat and bus tours. Casinos and amusement parks can also be found in the town. After walking around for the majority of the morning, we all sat down and ate lunch together at a restaurant called Tims. We enjoyed good conversation and delicious food as we planned our next activities for the day. After lunch, we split up – half of us went to the market and the other half went on a boat ride around the island. The market was a chance to interact with the locals, while the boat ride was a chance to experience the defining waters of the town. 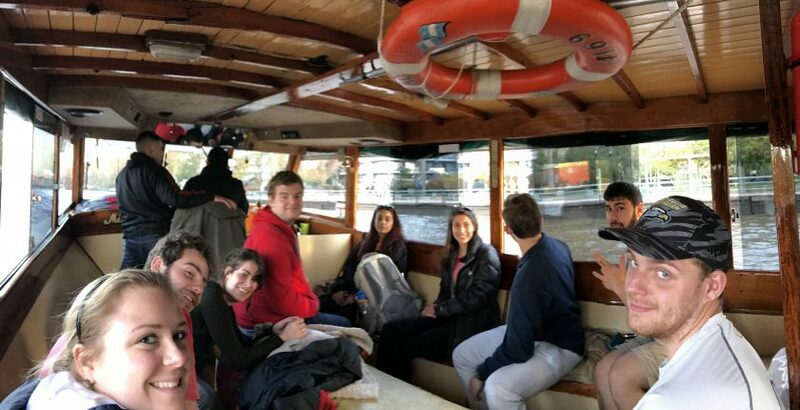 Overall, everyone was very happy with the well-needed Sunday getaway and returned to Buenos Aires refreshed and ready for another week of classes.